eServices for foreign Investors | Business Automation Ltd. 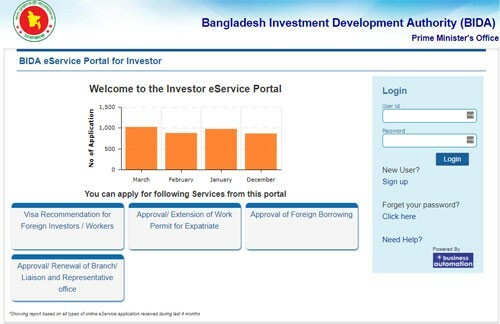 The Board of Investment launched its new streamlined application procedures Industry Registration, Visa Recommendation, Work Permit for Expatriate and Permission for branch/liaison/representative offices in Bangladesh – fully automated aiming to help investors get services quickly. Under the automated system, the prospective investors able to complete all the procedures just within a day. The online platform will enable the investors to complete the entire registration process, including submission of application for visas and work permits, attaching documents, tracking status, providing interactive feedback and seeking approval, without visiting the BoI office or using an intermediary. International Finance Corporation (IFC), a member of the World Bank Group, is helping the BoI make the organization fully automated to simplify the whole investment registration procedures and relevant services for local and foreign investors. Business Automation Ltd. has performed a leading roll for planning, design, development, integration as well as successful implementation the entire system through direct coordination with Board of Investment.